Although this sports mural was painted in Carlisle, Ontario, I also sell cool sports wallpaper murals that ship FREE within Canada and the USA. They’re super easy to hang and are removable when you’re ready for a new look. Are you thinking of having a sports mural in your home? Here are some photos of Jacob and Luke’s sports mural for inspiration! 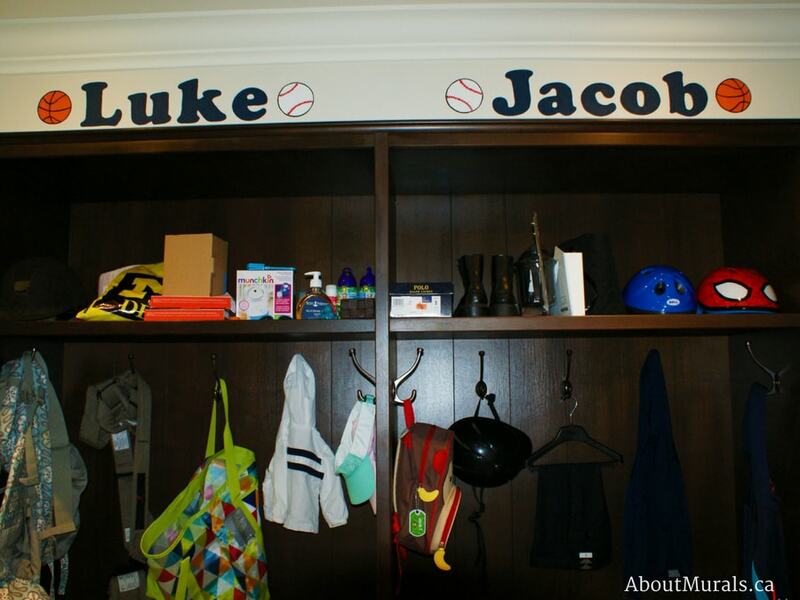 Luke and Jacob are little men with a big love of sports (just like their daddy). The toddlers fave’s are basketball and baseball. The walls were painted beige before I came to paint the sports mural, but latex painting is a service I offer before painting my wall murals, if you’d prefer to hire someone. I only use non-toxic acrylic paint for my murals and no-VOC latex paint for the walls, so the air is safe for your kids to breathe while they play or sleep – even on the night I finish the mural. My wallpaper murals are eco-friendly, too. 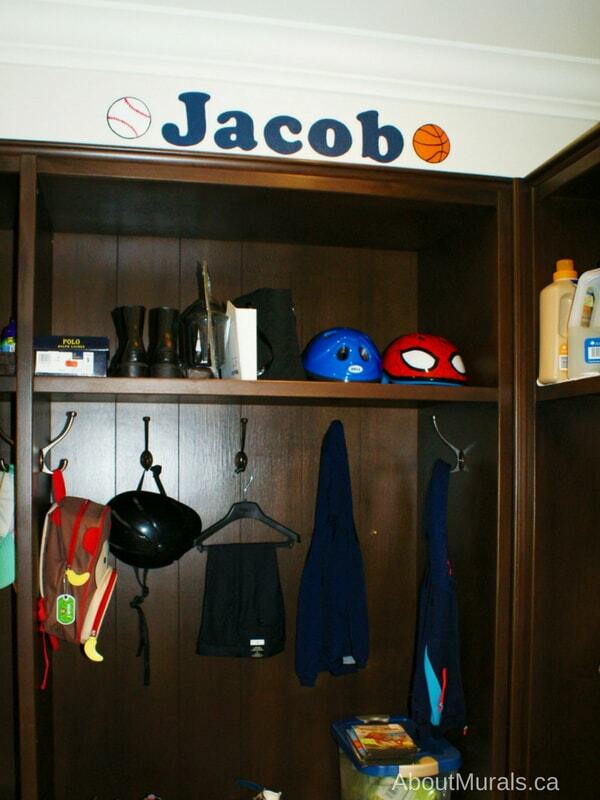 In this sports mural, I painted Luke and Jacob’s name, each one over their own cubby in the closet. Each name is framed with a basketball and baseball. 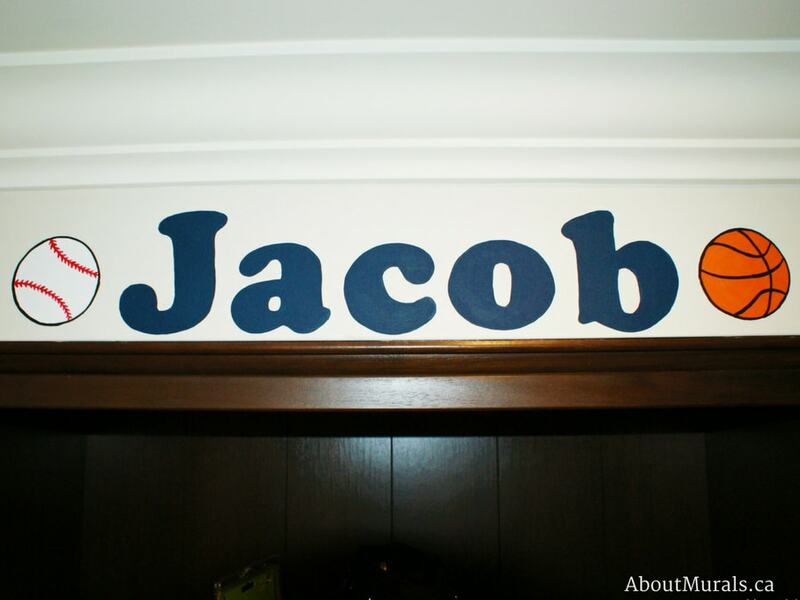 One amazing thing about wall murals that are painted is you can personalize them with your kid’s names, a favourite quote or lyric…the possibilities are endless! Like the Mural? Hire Me! If you’re thinking of having a sports mural painted and you like my style, you can hire me. I’ve painted kids wall murals, from Toronto to Niagara Falls, since 2005. I even got to paint a mural for a Mike Holmes show! Join my newsletter community and I’ll send you all the latest promotions, hot coupon codes and more inspirational photos of cool murals.